This reviewer’s copy was sent to her by the publisher. Thank you. After a trip to England where she discovered the existence of the Boy Scouts, Daisy was determined to create a similar club exclusively for girls. Her first meeting of the Girl Scouts was held on March 12, 1912. From its inception, Low believed that all girls should have the same opportunities as boys, both in education and physical activity. Girls went hiking, swimming, took long walks, learned how to tie knots, stop runaway horses, and enjoy the clean, fresh air. Children will love this picture book biography for its re-enforcement that girls can grow up to be anything. The overall design is very attractive. 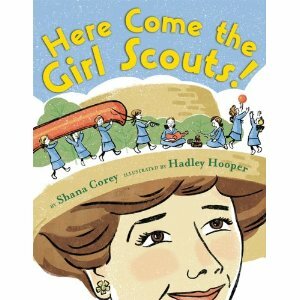 Hadley places quotes from the first Girl Scout Handbook, written by W. J. Hoxie liberally throughout the book. The quotes add so much depth to Low’s story. An author’s note and source notes round out this wonderful picture book biography. I really want to read this one! I was a Girl Scout for a few years in elementary school, and I can't say I remember all of it fondly, but some things I learned there have definitely stuck with me.